It’s definitely fall and that means it’s also football season. Yes, the Cupcake Fanatic is a football fan. This recipe from Sweet Pea’s Kitchen is for all the Ohio State fans, or just plain Ohio fans, or maybe just plain chocolate and peanut butter fans. Then again, who needs a reason to love a delicious cupcake? 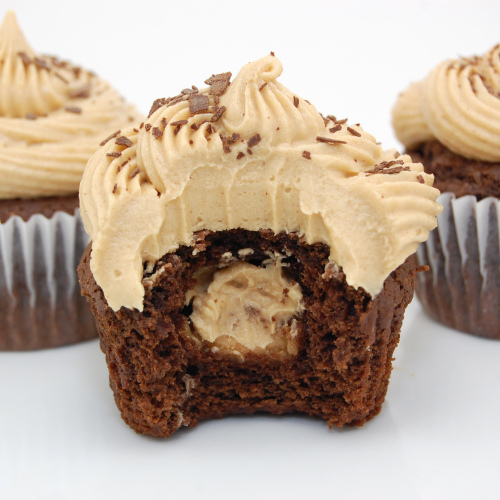 While we’re not necessarily Ohio State fans here at Cupcake Fanatic, we ARE fans of peanut butter filling inside a chocolate cupcake! To Make the Peanut Butter Ball Filling: In the bowl of a stand mixer fitted with the paddle attachment, on medium speed, mix confectioners’ sugar, peanut butter, tablespoons butter and vanilla until blended. Shape mixture into 24 balls using heaping teaspoons. (Balls will be sticky and don’t need to be perfectly shaped.) Place balls on waxed paper-lined cookie sheet; set aside. To Make the Cupcakes: Adjust oven rack to lower-middle position and preheat to 350 degrees F. Line pan with 24 cupcake liners. In a medium heatproof bowl, combine butter, chocolate, and cocoa. Set bowl over saucepan containing barely simmering water; heat mixture until butter and chocolate are melted and whisk until smooth and combined. Set aside and cool until just warm to the touch. In a small bowl, whisk flour, baking soda, and baking powder; set aside. In a medium bowl, whisk eggs; add sugar, vanilla, and salt until fully incorporated. Add cooled chocolate mixture and whisk until combined. Sift one-third of flour mixture over chocolate mixture and whisk until combined; whisk in sour cream until combined. Sift remaining flour mixture over chocolate mixture and whisk until batter is combined. Spoon 1 heaping tablespoon of batter into each cupcake liner. Drop 1 peanut butter ball in center of each cupcake. Top with remaining batter. Bake 18 to 20 minutes or until toothpick inserted into center of cupcakes comes out clean. Cool cupcakes in muffin pan on wire rack for 15 minutes. Carefully lift each cupcake from muffin pan and set on wire rack. Cool to room temperature before icing. To Make the Peanut Butter Frosting: in the bowl of a stand mixer fitted with the paddle attachment, beat the confectioners’ sugar, peanut butter, butter, vanilla and salt on medium-low speed until creamy, scraping down the bowl as you work. Add the heavy cream and beat on high speed until the mixture is light and smooth. Pipe frosting onto cooled cupcakes.